LAS VEGAS--(BUSINESS WIRE)--Today at the National Association of Broadcasters Convention, LaCie, the premium brand from Seagate Technology plc (NASDAQ: STX), announced the LaCie® 12big Thunderbolt™ 3, a professional 12-bay desktop RAID storage unit. With up to 96TB of capacity, the breakthrough performance of Thunderbolt 3 and RAID 5/6, the LaCie 12big helps video professionals meet the data demands of 4/5/6K cameras. At up to 96TB, the LaCie 12big boasts a 50 percent higher capacity* than any other desktop direct attached storage solution on the market—with a footprint smaller than a tablet. It features Seagate’s enterprise-class drives with a five-year limited warranty for extraordinary reliability and data availability to safely store and edit massive amounts of ultra hi-res footage. 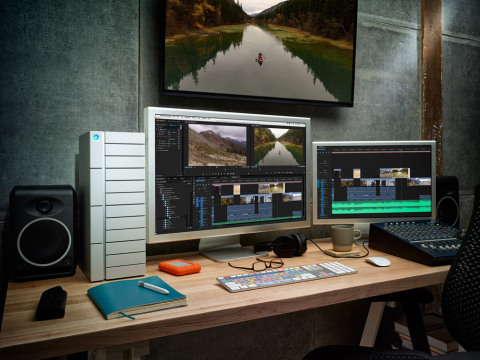 For the 12big, LaCie harnessed the breakthrough performance potential of Thunderbolt 3 technology and squeezed the absolute best speeds out of the hard drives. LaCie added a hardware RAID controller and 7200RPM drives, and the result is record-breaking speeds of up to 2600MB/s**—and 2400MB/s in RAID 5. That kind of speed can slash time off nearly every post-production workflow task. Users can ingest hours of RAW footage from a Blackmagic® cinema camera into Adobe® Premiere® Pro in a fraction of the time. They can then edit multiple streams of ProRes 422 (HQ), ProRes 444 XQ, as well as uncompressed HD 10-bit and 12-bit video. For big projects packed with high-def clips, thumbnail and preview rendering becomes much more responsive. With double the video bandwidth of its predecessor, Thunderbolt 3 lets the user daisy chain dual 4K displays or a single 5K display to the LaCie 12big. With two 4K displays, a video pro can spread out his/her workspace by dedicating one display to the timeline and the other to previewing 4K footage. It is even possible to provide power to a compatible laptop through the Thunderbolt 3 cable**. With up to 96TB of capacity, the LaCie 12big can store 100 hours of 4K ProRes 444 XQ footage in RAID 5▲. With that capacity, it’s possible to store footage from 48 LaCie Rugged Thunderbolt 2TB shuttle drives. Instead of buying a new storage device every time more capacity is needed, LaCie recommends pros invest up front in a future-proof, RAID-protected solution. This consolidated approach improves data access and security, which can save money in the long term. The LaCie 12big features 256MB cache, 7200RPM Seagate enterprise-class drives for superb accessibility, reliability and robust performance. Designed to operate 24×7 on 16-bay racks (instead of 8×5 operations for traditional hard drives), these HDDs are rated for 8760 hours of operation per year for extraordinary availability. The LaCie 12big also comes with a five-year limited warranty that covers drives, enclosure and spare parts. The redesigned LaCie RAID Manager offers an intuitive interface to administer the LaCie 12big. A new and more user-friendly interface assists the user in setting up and monitoring storage. Wizards help easily create and manage volumes optimized for individual needs. Plus it offers advanced features such as CPU settings, auto rebuild, and drive diagnostics. From the front of the product, drive status LEDs keep track of drive health and RAID build status, and drives can be conveniently accessed. Ensuring long-term component health, the aluminum enclosure dissipates heat efficiently and four thermoregulated fans pull heat away from the drives. And even if a fan fails, the product is still fully functional. For universal compatibility, users can connect to USB-C laptops—and even USB 3.0 computers via the included USB-C to USB-A cable. LaCie, the premium brand from Seagate Technology, designs world-class external storage products for Apple® and PC users. LaCie differentiates itself with sleek design and unmatched technical performance. Find out more at www.lacie.com. © 2016 Seagate Technology LLC. All rights reserved. LaCie and the LaCie logo are trademarks or registered trademarks of Seagate Technology LLC or of its affiliated companies. Thunderbolt and the Thunderbolt logo are trademarks of Intel Corporation in the U.S. and/or other countries. Other trademarks or registered trademarks are the property of their respective owners. When referring to drive capacity, one terabyte, or TB, equals one thousand billion bytes. Your computer’s operating system may use a different standard of measurement and report a lower capacity. In addition, some of the listed capacity is used for formatting and other functions and will not be available for data storage. Seagate reserves the right to change, without notice, product offerings or specifications. ** Actual data rates may vary depending on operating environment and other factors, such as RAID mode, RAID configuration, disk capacity, and system configuration. *** Delivers up to 45W (port A) or 15W (port B) to power compatible laptops. ▲ Based on 764GB per hour of 4K ProRes 444 XQ footage (source). Quantitative usage examples for various applications are for illustrative purposes.